The students from Anne Kornfeld’s Media Arts classes at Newcomers High School participated in a digital collage workshop by Flux Factory artist-in-residence Lee Tusman. In this six-week residency at Newcomers, students learned how to create a photo essay and a self-portrait through an array of contemporary new media formats. Using the online platform, New Hive, students constructed images applying new media techniques such as imbuing of the “selfie” into a complex composition and the use of animated GIFs. Students researched and created digital media as a means of inquiry and self-expression to produce their immigration stories. 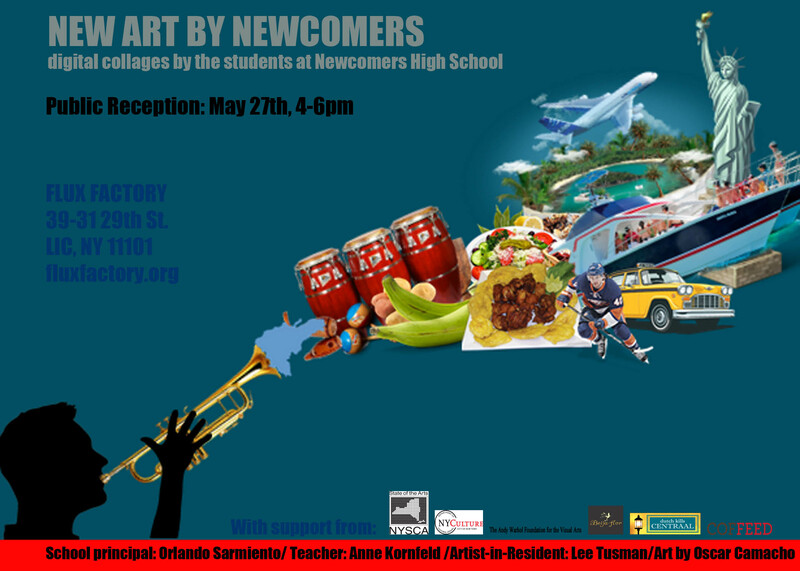 A reception will be held at Flux Factory on May 27th from 4-6pm, for the students, their families, and the local community. With generous support from: NYSCA, The Andy Warhol Foundation for the Arts, and The Department for Cultural Affairs. In-Kind Donation Support from: Beija-Flor, Dutch Kills Centraal, Minuteman Press, and Coffeed.